DEFY Acrylic Waterproofing Sealer is a clear, water-based, non-yellowing acrylic brick sealer formulated for use on above grade interior brick walls or exterior non-porous substrates such as brick, stone, smooth masonry, and other moderately dense surfaces. It can also be used as an acrylic paint additive to acrylic latex paints to help improve adhesion over all painted or unpainted surfaces, including masonry, concrete, block, and wood, masonry, or a primer for aluminum siding. DEFY Acrylic Waterproofing Sealer is particularly useful in strengthening adhesion to chalky painted surfaces. DEFY Acrylic Waterproofing Sealer is excellent for use over smooth, dense brick or concrete vertical surfaces to help insure a watertight finish. In addition to sealing masonry surfaces, this acrylic brick sealer will also add a beautiful satin sheen to interior brick walls, making them both attractive and washable. It can also be used over smooth vertical concrete or fired brick. It is not suitable for use on horizontal surfaces as well as very porous materials and, when applied, will alter the surface appearance of the substrate by darkening the surface and adding some sheen. Product is compatible with all water-based acrylic paints and can be painted after a minimum of 2 hours curing time. DEFY Acrylic Waterproofing Sealer will improve the adhesion of acrylic latex paint over chalky surfaces. 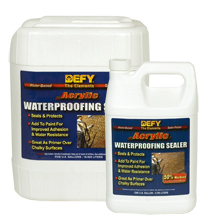 DEFY Acrylic Waterproofing Sealer is available in 1, 5, 30 and 55 gallon recyclable plastic containers and covers 80-150 square feet per gallon when used as a water sealant. Drying time is 1-2 hours.